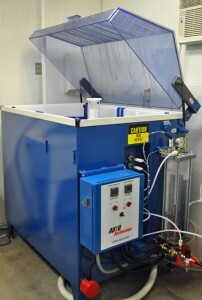 Salt Fog (Spray) Corrosion Testing - Metallurgical Technologies, Inc.
Salt fog ( salt spray) testing is the most commonly used form of accelerated corrosion testing. It allows investigation and comparison of the corrosion resistance of different metals and the effectiveness of coatings and finishes. It is an inexpensive proven method, performed in a controlled environment, with repeatable results. Salt fog corrosion testing allows a good evaluation of what can be expected before a new product or component is introduced to the market for usage. It can also be used to compare different coatings, materials or finishes, to determine which one is best for longer term service. Investigation of coating imperfections and adhesion before salt spray testing. 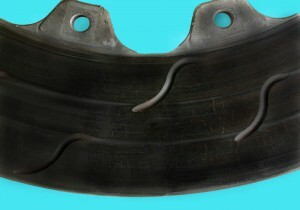 Photo at left shows a cast iron brake rotor with a black oxide coating before testing. 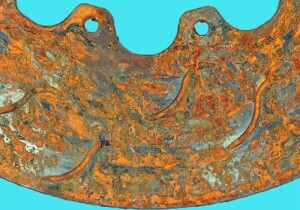 Photo at right shows the rotor after 48 hours in the salt spray chamber. MTi provides an easily understood report of test results, with tabulated data, interpretation of observations and findings, and photographic documentation, immediately upon completion of testing.